Drummer of Alt-J struggles to engage listeners on overlong electronic solo debut. 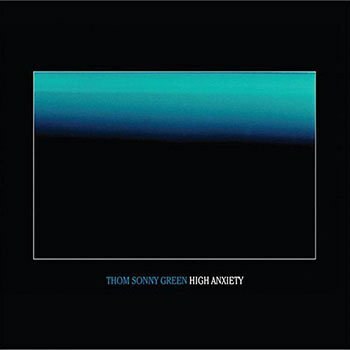 Thom Sonny Green -- known for his role as drummer for Mercury Prize-winning English band Alt-J -- recently released his first solo project, High Anxiety. It's a very sharp contrast to anything his band has done before, and this is almost too noticeable on the album: its whopping 70 minutes is filled with 21 ideas that move between ambient, atmospheric passages and emotive, booming beats. When I heard the style of the album, I immediately thought how strangely-perfectly it parallels Gorillaz as this band member's version of their The Fall: made in the midst of the artist being on tour, traveling from city to city, using just an iPad (or in Green's case, his laptop). Beyond this situational root, the substantially minimalist beats on both projects and their oppositely-colored covers fortify the connection. And, like The Fall, not all of High Anxiety works fantastically, but there is still great music to be found, and a consistent sonic "theme" throughout does a mutable job of keeping your attention throughout the project. I would consider Green's debut a beat-tape, and one that repeatedly gets stretched too thin. At its worst moments, the tracks are a five-minute expanse of two (or less!) little ideas: "Blew" provides cool atmosphere, and eventually breaks into a cool drum beat... but then it goes back to the atmosphere alone, and drags on for an extra two minutes that aren't greatly appreciated. The static stretches on through the next track "Arizona" (another Gorillaz connection), though at least this one is reminiscent of the two S U R V I V E members' work with the Stranger Things soundtrack. The repetition of a loop in addition to simple song structures and dynamics appears repeatedly on the album, like in the constantly-repeated synth loops of "Palms", "Phoenix", and "Cologne". The spooky strings of "Cologne" don't inspire much feeling; neither does the brighter version of the same thing on "Phoenix". The latter, with its following "fat"-but-not-"phat" drum beat "Large", results in the album's nadir. Even the late-in-the-game attempt to increase the pulse of listeners with the racing beat of "Meh" loses all of its steam through its whole five minutes and 30 seconds, the longest track on the album; the full stop right in the middle gives enough time for the listener to correctly predict, "Second verse, same as the first!" Thom Green does present some impressive moments here for listeners willing to rifle through all 21 tracks. The slam from the not-super-interesting Bonobo-sounding modern lounge of "Vienna" into the Sweet Valley-like "40 Beers" is a great moment, with the latter sounding like that part of a video game where you walk from the last healing spot/save point on your way to the final boss. It's also nice and minute-long, leaving before the listener would get annoyed. Soon after, the 4/4 pulse that almost never leaves each beat of the cinematically-layered "System" recalls the moving interior lights of a dark spaceship, nicely contrasted by that accenting sharp metal sound. "Oslo" begins with a night-drive synth melody recalling Daft Punk's "Ouverture", but then the song's second half falls into a passing woodwind and strings that blur by, surely much like the drives Green had to make between tour cities. The peak of the record can be argued between "Houston" and "Beach". The former combines beat and atmosphere as usual here, but this time it's ridiculously entrancing with its punctuating synth melodies and warped muted bell-sound arpeggios; all these elements actually keep your attention throughout. Intoxicating enough to lead you down that dark alleyway you've always passed by, "Beach" is comparatively simpler, featuring a rap-ready drum beat and a simple synth aided by the Hindu spirit-evoking chant of "Om Namah Shivaya", all aided by an excellent record-scratching breakdown that slowly pans between the ears while using the reverb of a small room. Closer to the album's end, the pair of "Preach" and "Christ" truly do evoke the idea of praying to/summoning the music gods Thom is trying to channel on this release. The album soon closes with "Neon Blue"'s excellent balance of a light, happy synth melody with a menacing, booming beat, and only the constant thread of hi-hats connecting them together. On High Anxiety, I feel the best tracks stand out easily as "40 Beers", "Houston", "Beach", and the final "Neon Blue". These four are truly great songs that serve as "tentpoles" for which the quality of this album is held up, and -- naturally -- each side has its lulls in quality over this gotta-be-twice-as-long-as-it-should-be release. Speaking to this, much of my malaise with the album comes from the fact that it's just too darn long! We'd say this same detraction towards any not-absolutely-incredible album of a length like this from any full band, let alone a solo display of beat fragments. I wonder if this overstretched-ness stems from the difficulty for an electronic musician to turn cool little loops into full tracks (I know this is certainly the case for me in my attempts so far). Releasing a project of said loops is all well and good to get many previews of what this artist's take on "music" is, as long as each example doesn't overstay its welcome like much of this album does. Plenty of the time, the ideas presented on High Anxiety provide an effectively scary ambiance, but no striking musical passages. The tracks where they're both present, though, are where this release shines.